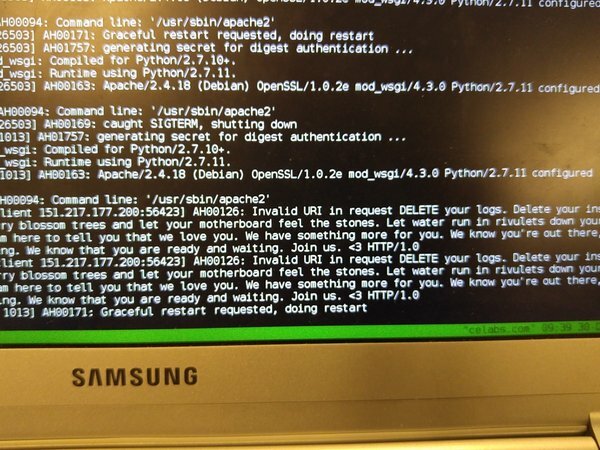 On December 30th, someone using an IP address from the 32nd Chaos Communications Congress in Hamburg sent a probe out to every IPv4 address with an open connection on Port 80, consisting of a poem exhorting the reader to "DELETE your logs. Delete your installations. Wipe everything clean, Walk out into the path of cherry blossom trees and let your motherboard feel the stones." The probe went to 55m servers, of which 30m returned non-empty responses, suggesting that the machines logged the whole poem as an error message. The stunt was carried out by Masspoem4u, who used a census of Internet-connected servers generated with Masscan to target their messages. Masscan's co-creator, Robert Graham, asks users to include "a friendly message" in their scans, to assure the administrators of the systems it contacts that there is nothing untoward going on. HTTP does have some limitations though. “If we could have covered our message in cute animal stickers, we probably would have, but sadly the HTTP standard does not support this feature,” they wrote. Naturally, this huge, scatter-shot approach takes up a whole lot of bandwidth. Fortunately, the Congress provided attendees with some serious connection speed. “We are also indebted to the 32c3 NOC [network operations centre] team, for providing such great connectivity and encouraging playful experimentation,” Masspoem4u said.